Buenos Aires' streets are full of old and decrepit cars. The other day I came across this green-blue-ish jalopy car parked in the streets of Palermo. It looked as if it would just fall apart and made me wonder what it was held together with. I saw at least no tape or string. Another point that caught my eye was the car's perfect adaption to its environment--its color almost matched the color of the facade of the houses! If you like these jalopies as I do there is another one for you here. 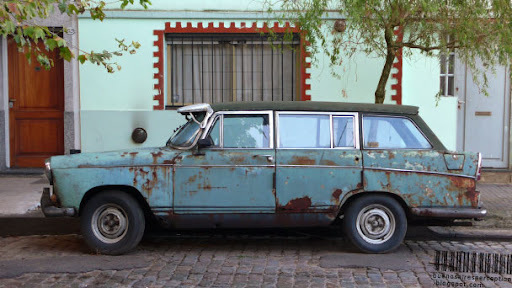 Well, if Argentina had a "cash-for-clunkers" program, this one would certainly qualify. Enjoy even more ABC Wednesday posts from around the world! Click here. R is for rough, rugged, rusty, rigid, ridiculous, rattling ride! A wonderful photo. I love this car - matter of fact, I feel somewhat like that. rusty, ridiculous, rattly and still rollin'. :) Again, a great shot! What a great image. Isn't it one of those old Fiats? Hmm...It looks like it has been "fixed" with "new" windows - at least in part. I'll bet you it belches fumes when it takes off, too. But, I'd also guess that's the best some people can do. And if you've got to go somewhere, it's better than nothing! I think this car would also classify for the Pimp my ride as their greatest challenge... :-) What about registration and insurance? How can you get it? Or the police decides to overlook these things? My guy always has a "batata" like this one. He fixes it, then trades it for another one. One batata is like another to me, but as Jacob says, it's the best that some people can do. The problem here is BsAs is being able to legally buy gas, and also to have a legal license plate. It's very complicated and makes even a batata more expensive. If the jalopy in the photo has a current plate and the papers to buy fuel, it's worth a lot, believe me. Always love your photos. Thank you! This rusty jalopy seems all the more interesting for appearing rather stretched. Now that's a strange car ... but a wonderful find and photo - the colouring is nice. Astonishing that it's still running. Oddly beautiful. There's something fun about rusty vehicles - providing you don't expect me to ride in them! this was used for taxi in 60 and 70's. Thanks for the pic. Argentina is definitely the capital of crappy cars. Never ceases to amaze me what still manages to make it down the street. A real achievement, in a way.